Spa-Rite Chlorine Free Spa Chemicals- No Salt, No Chlorine, No Odour! 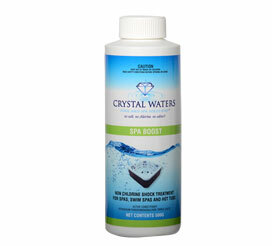 Crystal Waters is a unique chlorine free chemical system developed specifically for spas and swim spas. 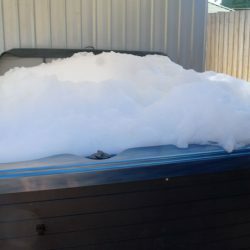 At last spa and swim spa owners can have the enjoyment of swimming and bathing in chlorine free water without the need for harsh, smelly chlorine based chemicals to provide sanitation. HOW OFTEN SHOULD I DOSE MY SPA? Dosing is just a matter of adjusting the pH, Alkalinity and Calcium. Then simply add 60mls of Spa Sanitiser and Clarifier (per 1,000 litres) and 20gms of Spa Boost (per 1,000 litres) once per week. WHAT IS THE ACTIVE CHEMICAL? Crystal Waters uses a unique sanitiser, Polihexanide Hydrachloride, to safely kill and prevent bacterial growth and ensure complete protection for bathers. The unique properties of Crystal Waters sanitiser means ALL family members can enjoy their spa, irrespective of skin or allergy conditions. 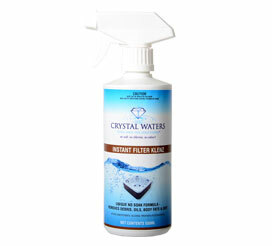 Crystal Waters is completely non-irritant and gentle and won’t affect asthma sufferers. Polihexanide Hydrachloride is extensively used in medical areas and hospitals as a powerful sanitiser for killing bacteria. It is commonly found in hand wash formulas, contact lens cleaners, surgical bandages, etc. It is a fully approved and registered sanitiser by APVMA for use in swimming pools and spas. Chlorine Remover I used to remove Chlorine and Bromine from water. Add when filling, refilling and topping up spa or swim spa. Spa Sanitiser is the heart of the chlorine free range and provides ongoing protection against harmful bacteria in your spa or swim spa. Add Spa Sanitiser weekly. Spa Clarifier is a unique clarifier that works in harmony with Spa Sanitiser to provide exceptional water clarity. Add Spa Clarifier weekly. Spa Boost is a powerful non chlorine oxidiser that helps burn out impurities and body fats. Add Spa Boost weekly and after bather use. Alkalinity Enhancer used to increase the Total Alkalinity and pH. Add as required. pH Reducer used to lower the pH and Total Alkalinity. Add as required. Calcium Enhancer used to raise Calcium Hardness. Add as required. A test strip that tests Biguanide (Sanitiser), pH, Total Alkalinity and Total Hardness (Calcium). You should test your spa once a week an minimum. Regular maintenance of your filters is required to help keep your water crystal clear. By not cleaning your filters regularly it can also cause your water to go cloudy, or in some cases create foamy water. Neglect of your filters can cause water flow blockage leading to damage of pumps and equipment. It is recommended to clean your filters with a garden hose using high pressure, (NOT a high pressure cleaner) once every 10 person hours maximum. So if 2 people are in a spa for 5 hours each the filter should be cleaned. Remember, if you drink alochol in your spa, you perspire twice as much meaning you only get a maximum of 5 person hours out of your filters. By cleaning your filters regularly, you can get 9,000 hours from a set of filters. That’s one year! This is worked on hours the filters have been in your spa, to be used as a guide only. 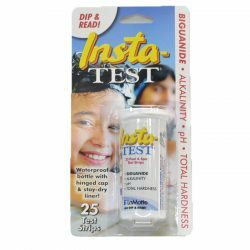 Instant Filter Klenz is a spray on/hose off instant filter cartridge cleaner. It is powerful and fast acting. Rinse thoroughly to remove all body fat and filter clean. Cartridges should be cleaned weekly or after heavy bather load. OR a maximum of every 10 person hours. 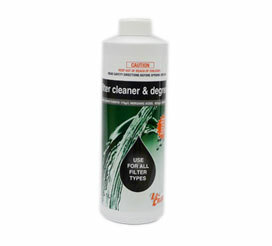 Concentrated Filter Cleaner is a powerful soaking formula used for cleaning of filters. Simply leave filters to soak for 24 hours. Rinse thoroughly to remove all body fat and filter clean. Cartridges should be cleaned weekly or after heavy bather load. OR a maximum of every 10 person hours. Pipe Klenz will thoroughly cleanse oils and body fats from pipework, use when concerting an existing spa, and at least once per year. HOW OFTEN SHOULD I RUN A PIPE CLEANER? Crystal Waters Pipe Klenz has been specially formulated to thoroughly cleanse spa pipes and equipment from body fats and build ups of grease and oils that coat the inside of spa and hot tub pipe work. All spas should be treated with Crystal Waters Pipe Klenz at least once per year or more often depending on use. Body fats and oils eventually cause foaming in spas as well as consume sanitisers used for the control of bacteria. HOW DO I RUN A PIPE CLEANER? To run a pipe cleaner through your spa simply add 250ml of Crystal Waters Pipe Klenz per 1,000 liters of spa water, run filter for 2 hours and remove the excess foaming from the water surface. The spa should then be thoroughly drained and rinsed and then refilled. Just because you can’t see the body fats doesn’t mean they’re not there: they will be! WHAT ARE THE BENFITS OF RUNNING A PIPE CLEANER? Running a pipe cleaner is important as it not only makes your spa easier to look after but also helps keep the water clean. 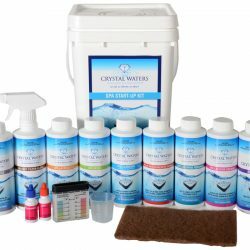 If you have just purchased a new spa or want to convert over to Crystal Waters then a start up kit would be the best way to go. 500ml Spa Santiser, 500ml Spa Clarifier, 500gms Spa Boost, 500gms Spa pH and Alkalinity Enhancer, Spa pH Reducer, 500gms Spa Calcium Enhancer, 500gms Chlorine Remover, 500mls Instant Filter Klenz, 500mls Pipe Klenz, Test Strips, Biguanide Test Kit, Spa Pad, Measuring Cup, Instructions.